Besides eating my way around Paris, I did do some sightseeing. 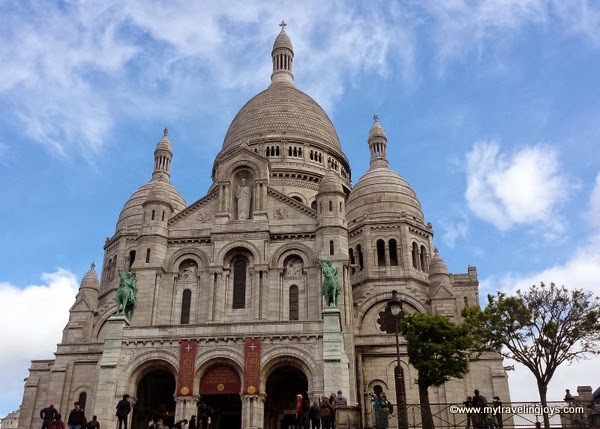 After climbing up the steep, winding streets of the Montmartre neighborhood, I knew I still had at least 300 steps to reach the top of the white dome of the Sacré-Cœur Basilica (The Basilica of the Sacred Heart of Paris). This extra bit of exercise was definitely worth seeing this popular landmark located at the highest point in the city. The Sacré-Cœur Basilica shines a brilliant white and simply cannot be missed on the horizon in Montmartre. Construction for this Roman Catholic Church began in 1875 but wasn’t finished until 1914 and was dedicated after the end of World War I in 1919. Interestingly, the church doesn’t stay white because of a special paint, but rather the answer is scientific. The church was built from travertine stone, which was quarried in Chateau-Landon, about 90 minutes south of Paris. Travertine, a form of limestone deposited by mineral hot springs, releases a chemical called calcite, which means the building stays white even when exposed to the elements. The Coliseum in Rome also was built from travertine stone. I bought a combination ticket for 8 euros so I could see both the crypt and the dome. The crypt contains the statues of saints and an underground chapel. I didn’t find the crypt particularly interesting, but maybe if you’re more religious you would feel differently. However, I was eager to tackle the 300 steps of the dome to be rewarded with sweeping views over Paris; and, I was not disappointed. The panoramic view of Paris is simply spectacular! I got very lucky with the weather as the day before it was raining all afternoon and evening. But the day I went to see the Sacré-Cœur Basilica, I was surrounded by blue skies and fluffy white clouds as you can see from my photos. Pictures aren’t allowed inside the basilica, but I still popped inside and admired the architecture. When you’re in Paris, I’d highly recommend visiting Sacré-Cœur Basilica and don’t forget your camera! Lines of rooftops in Paris. Access to the Dome and Crypt is at the bottom of the staircase outside the Basilica on the lefthand side. Opening hours: every day from 8:30 a.m.-8 p.m. (May to September), but can vary according to the weather. 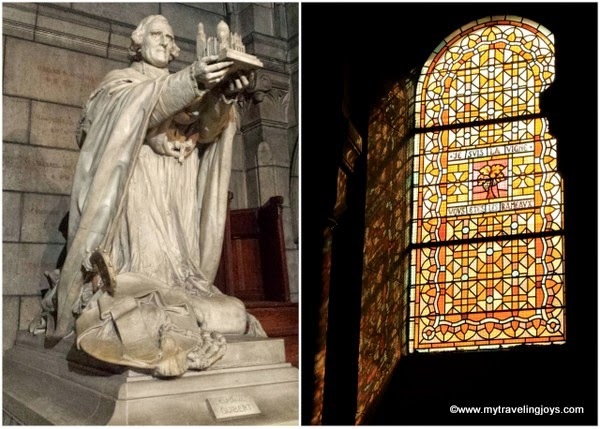 How to get to the Sacré-Cœur Basilica? The simplest way is to arrive at the Anvers metro station and to climb up Steinkerque street which will lead you to the Montmartre funicula - the easiest means of transportation. I skipped the funicular and climbed the 80 steps in front of the basilica. Tip: Also, avoid the persistent men selling 10 euro bracelets by the funicular and on the steps!